Following a failed drug test at the Seattle Supercross in early 2014, motocross/supercross great James Stewart was suspended by the FIM for a lengthy period of time that effectively removed him from the racing calendar in 2015. An appeal by Stewart of the FIM’s suspension was denied. Finally back on the track for the opening round of the 2016 Monster Energy AMA Supercross series at Anaheim on January 9 of this year, Stewart suffered some horrible luck early in the main event when current points’ leader Ryan Dungey (KTM) collided with him in a corner. Stewart went down hard and hit his head … rendering him unconscious for a short period of time. The resulting concussion not only ended his race on January 9, he has missed rounds 2 and 3 of the series in San Diego and back at Anaheim, respectively. Stewart is considered by many to be the fastest off-road rider ever, although his career championship total falls well short of Ricky Carmichael’s. 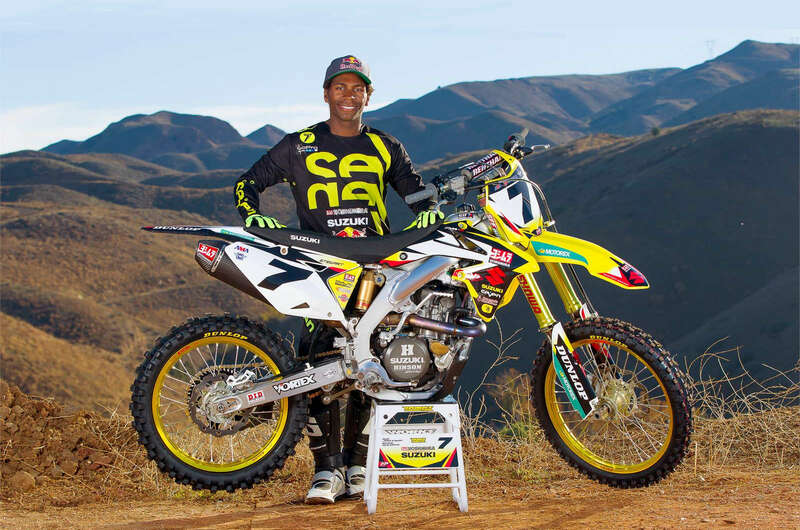 Stewart has phenomenal natural speed, but despite obtaining several AMA championships, he is known almost as well for his tendency to crash and injure himself. Now 30 years old, Stewart had high hopes for this supercross series. He is expected to race next weekend in Oakland, but his chances at a title this year are all but lost with zero points after 3 rounds. Interestingly, his old nemesis Chad Reed (now aboard a Yamaha), is showing great speed this year, having taken second place at each of the last two rounds. At 33, Reed is the oldest rider currently competing in the supercross series. Chino, CA (Jan. 22, 2016) – Yoshimura Suzuki Factory Racing rider James Stewart will miss this Saturday’s Anaheim II Supercross. Stewart rode late this week, but still is not feeling 100 percent fit to race. He is slated to return to action for the following round in Oakland, California, on January 30th. Stewart was briefly knocked unconscious in the season opener at Anaheim I on Jan. 9, while running near the front early in the main event. He ran in practice in San Diego this past weekend before electing to not race. Stewart’s teammate Blake Baggett has been back on the practice track and is getting back to fitness quickly. He was injured in a pre-season testing fall and is also slated to be back in action at Oakland. “We’re looking forward to having both James and Blake back for Oakland and having the team back to full strength,” Webb concluded. Hope James comes back strong to add to the competition. Been following MX since the beginning and even did all the local tracks in the early ’70’s. Yea ., I’m starting to get old. LOL. A concussion is serious business. I had a good one from a hit and run in ’86 and it put me off 2 wheels for 6 yrs before I felt comfy. Major Vertigo Problem which just took time to heal. With Chad doing so well, I hope we can have some more James/Chad duels when they were both on 125’s. I do believe this Supercross Season is going to get tighter as it progresses. If, we can keep everybody healthy. No Dungey should not have been penalized…There had been several incidents in that same corner….The jump just before the corner was too big to be that close to it in my opinion and a lot of riders had issues with crossing the entire berm after trying to clear it….Stewart squared the corner and Dungey cleared that last jump impairing his ability to stop in time and no way for either of them to know what the other was going to do…….Just an unfortunate incident….Yeah it’s a bummer cause lots of folks wanted to see Stewart in the game…. I agree Stewart is a point &shoot rider! If only he had a brain! Ha! Remember the Ricky Carmichael fuelgate thing back around ’05 or ’06? yea ran gas that failed the lead test but the AMA was afraid to ban him since he was a factory superstar. People say that. Promoters fear it. But I’ve never known a sport that didn’t go on after the departure of one of these “bigger than the sport” stars. Fans don’t waste much time choosing new heroes. True, true. My wife is the head of HR for a big company (40 plants 800 employees)and when employees incl execs get uppity she reminds them that no one is indispensable. The company was there before they got there, and it will be there after they are long gone. See the movie “Concussion.” Absolute fail the MPA did not nominate Will Smith for Best Actor. An incredible movie. James Stewart may be as ignorant and weak-willed as he was fast. Taking banned drugs with the result of being banished for an entire season is not exactly a great path to success. I wonder if Stewart employed drugs to regain an edge he lost as a result of his age compared to younger riders. He didn’t take “banned” drugs. He took drugs prescribed to him by his doctor. What he failed to do was to get a therapeutical use exemption (TEU). He now has the said TEU and can take the drugs and race. Aderall is a banned drug, prescription or not, hence the need for an exemption. We’ll never know why he didn’t get the TUE. He and his coaches surely knew he needed one and for some reason they didn’t follow through.. I am very curious what the drug is. The drug was adderall if I remember right, or least definitely one of those ADHD prescription drugs. He was sensational to watch in his early years but now seems to be out of luck and that’s sad. i’d like to see him turn it around. Like I said at the time, Dungey shoulda been penalized. He was outa control and clearly in the “lane” going the other way. His line was fine if he was alone in the corner or if Stewart was alongside him, but not with Stewart so far ahead. It’s disappointing that he wasn’t called on it. Strap yourself in and watch.